Keenan Lewis Returns to Pittsburgh; Should the Steelers Have Kept Him? Keenan Lewis returns to Pittsburgh with the Saints this weekend, which begs the question – should the Steelers have kept him? The answer was crystal clear in during the Steelers 2013 off season – in a perfect world the Steelers should have and probably would have resigned Lewis. The Steelers drafted Lewis in the 3rd round of the 2009 NFL draft, but his first year in Pittsburgh was lost to injury. Lewis struggled in his second year, but under the tutelage of Carnell Lake, Lewis showed signs of life in 2011, and had a breakout season in 2012. Ike Taylor had played well in 2012, but was already pushing 33 in a position that is decidedly a young man’s game. In pure football terms, bringing back Lewis would have been a no-brainer. The problem was the Steelers only had 2 million dollars in salary cap space, the 4th worst in the NFL. To gain breathing room the Steelers needed to restructure multiple contracts, and cut James Harrison and cut Willie Colon. They resigned William Gay and they placed their faith in the development Cortez Allen, who in just 3 starts accounted for six turnovers. Personnel success in the salary cap isn’t about simple talent evaluation, its about getting the best bang for your salary cap buck. By signing Gay instead of even more painful salary cap cuts needed to make an offer to Lewis, Kevin Colbert and Mike Tomin gambled that they’d come out ahead. Keenan Lewis had a very strong year in 2013 for the Saints, coming down with four picks and 1 forced fumble. There’s an irony there, because the word was the Steelers brass favored Allen precisely because he was better at creating turnovers. Allen, for his part has four picks between 2013 and 2014, and had an equal number of passes defensed in 2013. Still, those numbers do not indicate his struggles, particularly in this year where he’s been so bad he got benched. However, judging by the numbers, here in 2014 Lewis play has dropped off. He’s got only 1 interception and as many passes defensed as Allen. 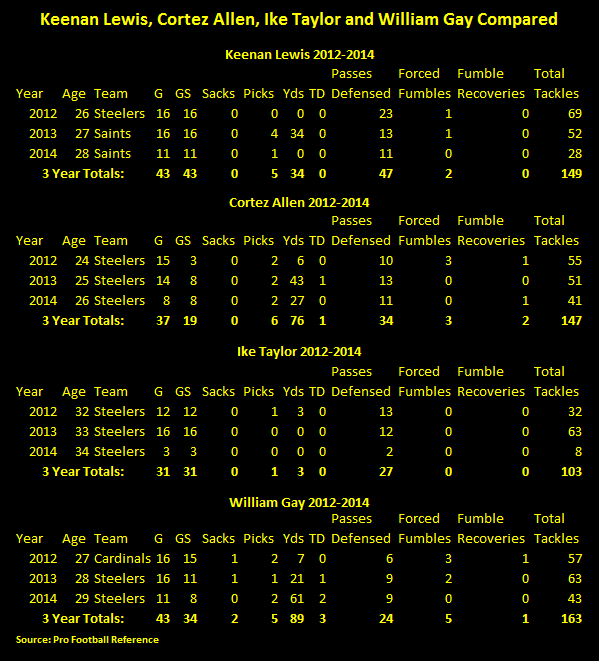 Ike Taylor struggled in 2013 in ways the numbers don’t show. Here in 2014 he played well vs. Baltimore and was strong vs. Carolina, but has been hurt since then. While its no indictment on him as a player, you don’t get much for your salary cap buck when your guys are in street clothes on the sideline. William Gay presents the most interesting case of all four. With a cap number of 1.6 million, Gay is easily the cheapest of the four and perhaps his production has been the most consistent. Gay’s had 2 pick sixes this year, another in 2013, and while his pass defense numbers don’t look good, he made a key stop vs. Cleveland in the opener. So as Keenan Lewis returns to Pittsburgh, it is still fair to say the Steelers should have signed him, but its also fair to say that in salary cap terms they’ve managed well nonetheless – although that analysis could change in future years. It is an open question as to whether Allen rebounds from a bad 2014, but his salary cap number is headed up regardless. This entry was posted in Steelers 2013 free agent focus, Steelers 2014 season and tagged Cortez Allen, Keenan Lewis, Kevin Colbert, Mike Tomlin, Steelers vs. Saints, William Gay. Bookmark the permalink. Steelers Defense “Band Back Together” vs. Saints – Is That a Good Thing…?